TAKEXCO MALAYSIA SDN. BHD. 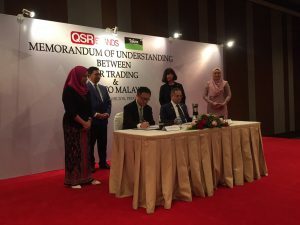 has entered into a Memorandum of Understanding (MoU) with QSR Brands (M) Holdings Bhd, renowned as one of halal pioneers in Malaysian food industry, through its marketing and distribution arm, QSR Trading Sdn Bhd (QSRT) on 29 October 2018 to form a business partnership. QSR Trading will be the distributor of co-branded halal sanitizer “Takex Clean QSR” and “Takex Clean Extra QSR”, which are the world first food grade halal sanitizers. Our products will be distributed from January 2019 in Malaysia. QSR Brands is a subsidiary of Johor Corporation, a public corporation in Johor. It operates fast-food restaurants, namely “KFC” and “Pizza Hut” and has more than 1,200 stores in 4 countries including Malaysia. QSR Brands also produces and processes poultry. All the ingredients used in restaurants are procured within its group companies. QSR Brands is one of few integrated food operators. Datuk Azahari, Managing Director of QSR Brands and its subsidiary companies, expresses understanding of our food grade halal sanitizer and highly values our company as a provider of hygiene control solutions in Halal Industry. He has wished to become a player representing the halal industry in collaboration between Malaysia and Japan. We agreed to develop co-branded products reached to enter into MoU. Dato’ Kamaruzzaman, the President & Chief Executive of Johor Corporation and Chairman of QSR Brands, attended the ceremony. His presence indicates their high expectation on our collaboration. In the ceremony, Ms. Kumi Okada, President of Takex Co., Ltd., expressed our gratitude on behalf of Takexco Malaysia and Takex. Mr. Takeshi Okada, Senior Executive Director, signed a memorandum of understanding. QSR Brands aims for distribution in its own network and distribution to hypermarkets throughout Malaysia. Datuk Azahari expressed his thought that QSR Brands will adopt the sanitizers and products that will be on sale in the future at Malaysian brand restaurants owned by QSR Brands. Ms. Kumi Okada shared information about our developing products, food shelf life extender. With this food shelf life extender, we can contribute food industries to reduce food waste and also to increase the profit. We are now preparing for applying to JAKIM halal certification for new products. It is confirmed that we will have further discussion with QSR Brands on this distribution once products are ready to be launched. Besides, Ms. Okada shared that we would like to propose food safety together in collaboration with QSR Brands. 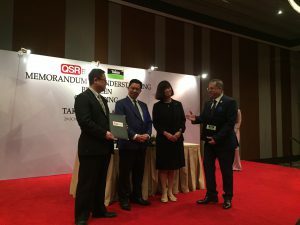 As well as we are greatly honored to enter into the partnership with QSR Brands, which is leading the food industry in Malaysia, we are confident that our partnership with will be a clue to boost halal industry more than ever. Datuk Azahari express his thought that he will welcome any proposal for further growth for Malaysian economics and country. We will also make efforts to contribute further development in Malaysia in collaboration with QSR Brands. We hope you will look forward to our leap forward!! 過去の投稿前 The office of TAKEXCO Malaysia Sdn. Bhd., our local corporation in Malaysia, has officially opened in Kuala Lumpur as our Malaysian base. Copyright (c) Takex Co.,Ltd all rights reserved.